LINCOLNSHIRE dealership Twells of Billinghay has been named Vauxhall’s top-performing retailer based on the level of quality delivered to its customers. The manufacturer’s Customer Excellence Awards have been running for eight years, with Twells of Billinghay having won an award each year since 2012. This year, though, it came top out of the 43 Vauxhall retailers nationwide that received one of the awards, after scoring the most in Vauxhall’s customer purchase satisfaction and service satisfaction surveys, which were calculated at the end of 2018. Customers are invited to take part in the customer satisfaction programme after buying a new vehicle or when they’ve had one serviced. 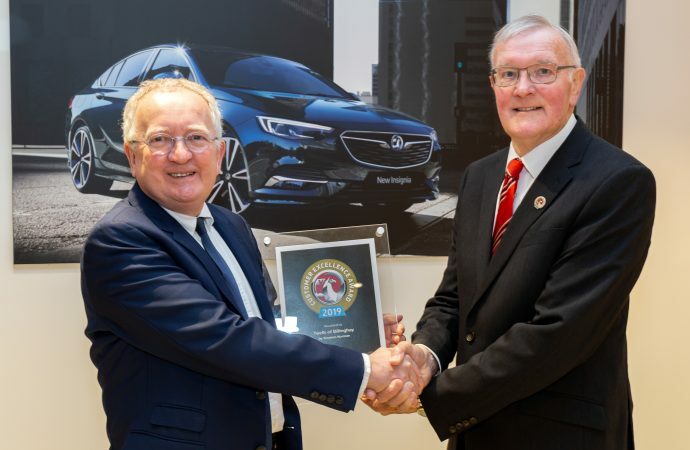 To celebrate the accolade, Vauxhall group managing director Stephen Norman presented dealer principal John Twells and his team with their award. ‘I would like to congratulate the team at Twells of Billinghay on this outstanding achievement,’ said Norman, pictured left. ‘Twells has delivered again and should be proud of their efforts. It’s great to see Vauxhall retailers providing such a fantastic service to our customers. Twells, pictured right, said: ‘We are delighted to be recognised as the top-performing Vauxhall retailer with this fantastic Customer Excellence Award. It is a testament to the hard work and dedication of the team here.